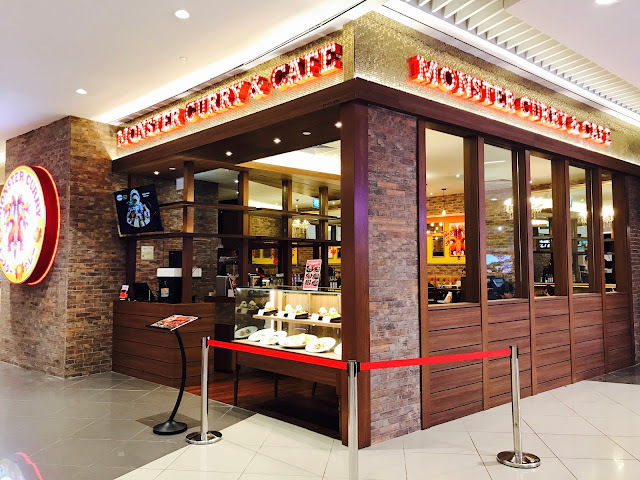 I have been looking forward to the opening of the Suntec City outlet of Monster Curry ever since the poster first came out. Monster Curry’s signature curry contains 14 species and vegetables, which are cooked for 2 days to bring out the full flavours of the ingredients. 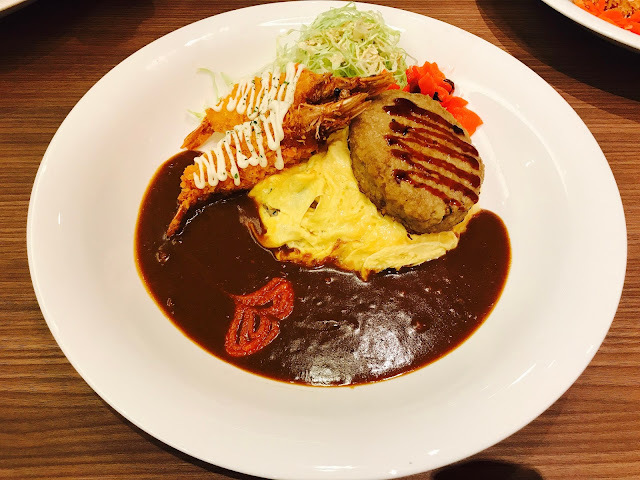 Monster Curry is the only restaurant in Singapore to serve “demi-glace” curry, marked by the deep brown colour and intense flavours of the curry. 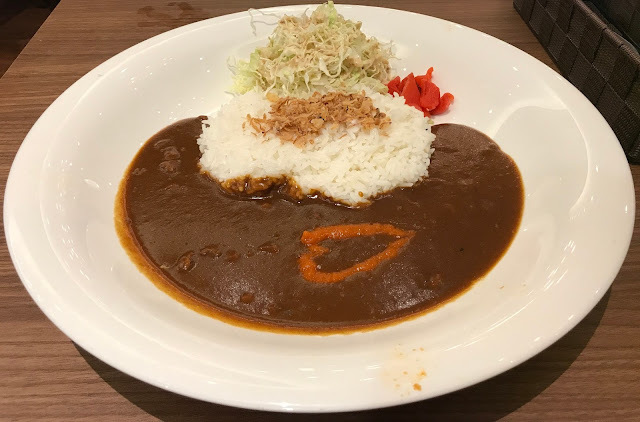 There are altogether 5 spiciness levels and chilli “hearts” are added to the curry to achieve the desired spiciness: 1 heart = spicy level 1, 2 hearts = spicy level 2 and so on. Mind you, Monster Curry’s chilli sauce is not the usual kind that you can get at any supermarket. It is a special recipe of chilli padi, garlic, ginger and celery. 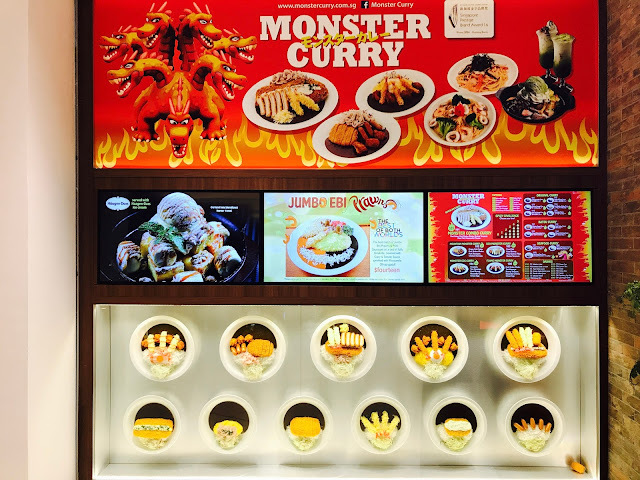 This is the actual menu of Monster Curry’s Suntec City outlet. 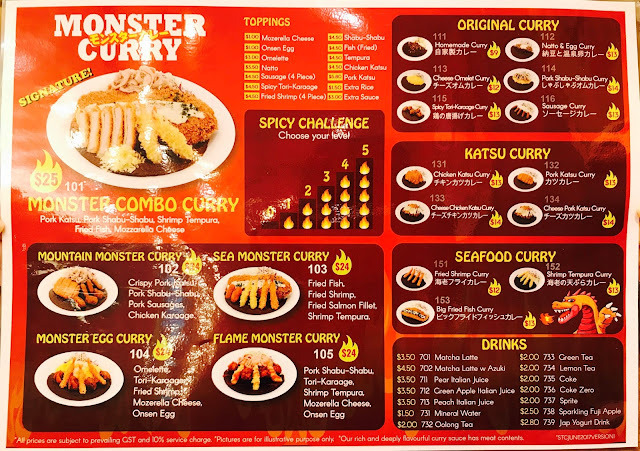 The menu is divided into Monster Curry, Katsu Curry, Seafood Curry and Drinks. The curry is, all the same, the dishes are named after the ingredients that accompany the curry. This is the most basic Homemade Curry. You get a generous amount of fragrant rice and signature curry, accompanied by shredded lettuce with goma sauce and pickles. This is the best for tasting the quality of the curry which is rich and flavorful. 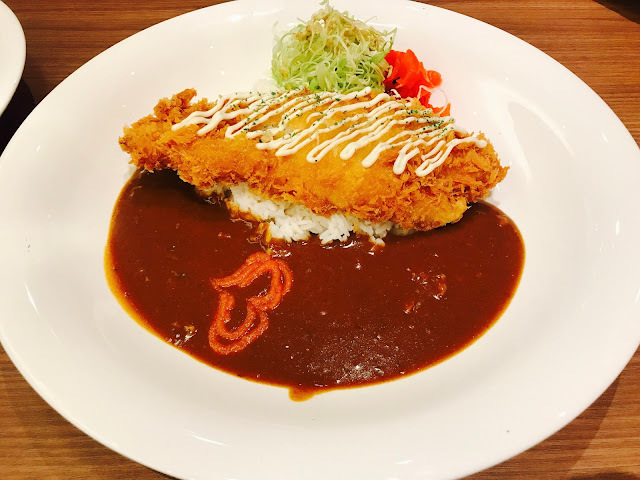 Pork Katsu Curry is one of the restaurant’s signature dish, the juicy pork cutlet is wrapped in a thin layer of batter and fried till crispy. 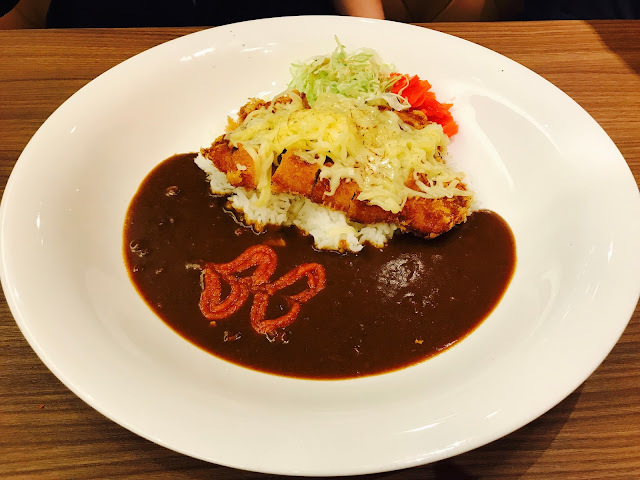 Cheese Pork Katsu Curry is the upgraded version with added cheese and the melted cheese gives the dish the cheesiness to bring it to another level of enjoyment. 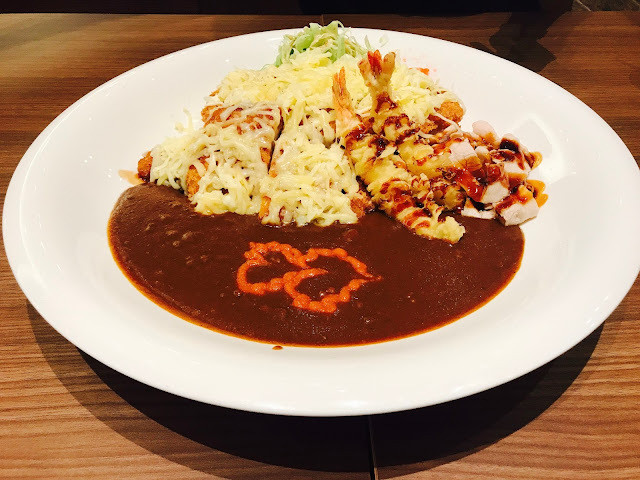 If you prefer chicken, there is Chicken Katsu Curry and Cheese Chicken Katsu Curry. Big Fried Fish Curry is the dish for seafood lovers. A huge piece of dory is wrapped in batter and fried till golden and crispy. You can be assured of the freshness of the fish as there is no fishy smell and the dory literally melts in the mouth. Of course, if prawns are more your thing, there is Fried Shrimp Curry and Fried Tempura Curry. When you can’t decide what to order, the best thing to do is to order one dish that has everything. 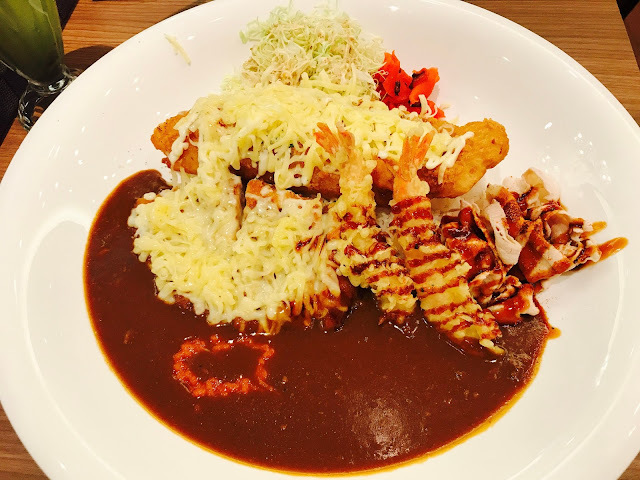 Monster Combo Curry is the ultimate combination meal where you get pork katsu, pork shabu-shabu, shrimp tempura, fried fish and mozzarella cheese arranged beautifully on top of a mountain of steaming rice. This is supposedly meant to be shared between 2 persons, but I personally feel that it is more than enough to feed 3 average eaters or even 4 small eaters. 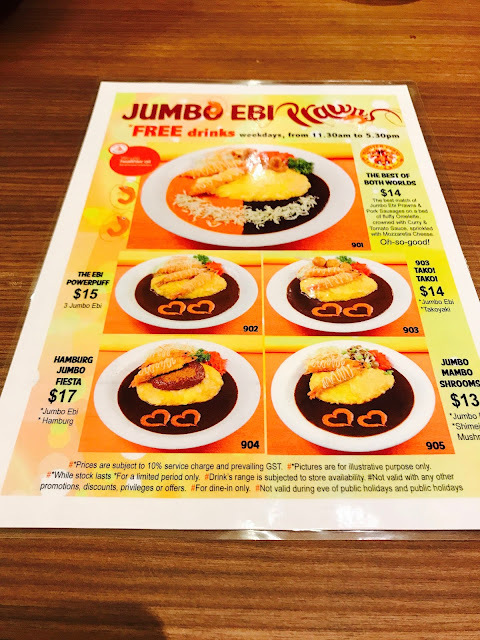 Monster Curry frequently have different promotions such as this Jumbo Ebi Prawns promotion where omelette rice is paired with huge prawn tempuras and Monster Curry’s signature curry. If you are a beef-lover like me, then you should definitely go for the Hamburg Jumbo Fiesta where you get an additional beef patty on top of the ebi prawns and omelette. 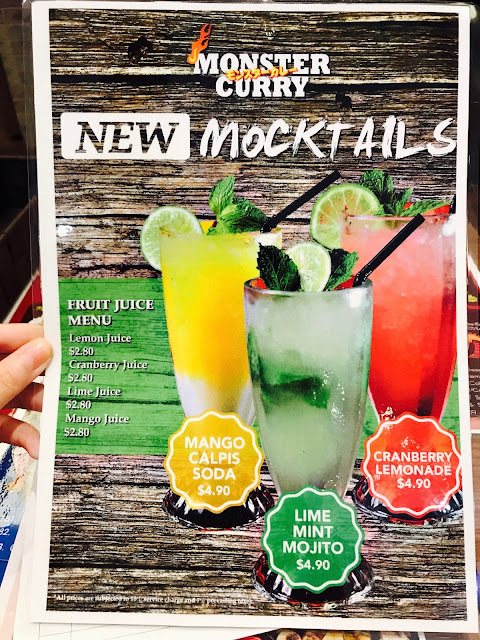 There are 14 drinks options at the Suntec City outlet of Monster Curry, two of the more unusual ones are Matcha Latte with Azuki and Pear Italian Juice. 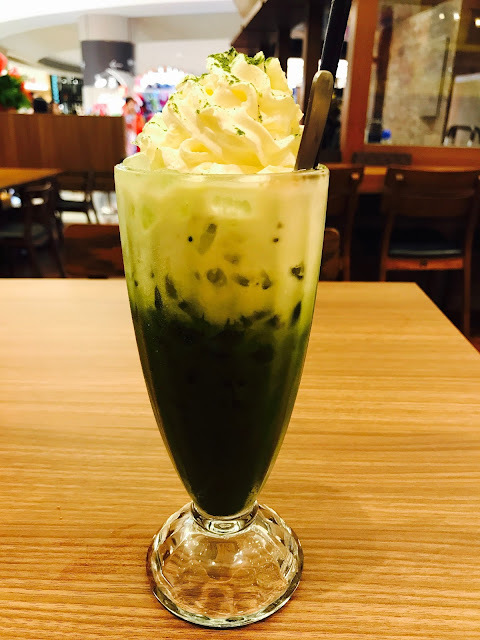 The matcha latte is a little sweet for my taste and the miserable few azuki beans at the bottom of the tall glass are difficult to scoop out underneath all the ice. 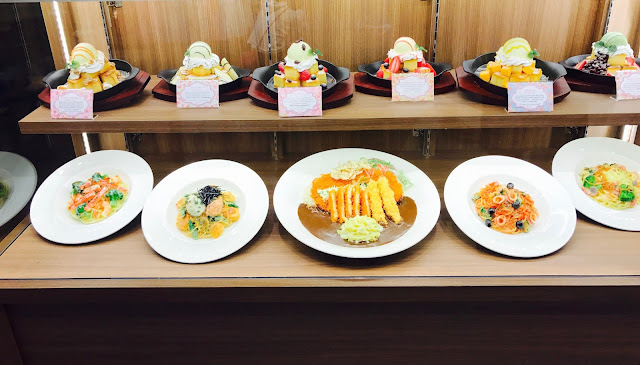 The window display of the delish-looking desserts has done a fantastic job of tempting me but I learnt that the desserts are only available from 2 pm – 6 pm, so I made a special trip to the Suntec City outlet of Monster Curry one day straight after work especially for the desserts. I got the Mixed Berry Honey Toast and it surpassed my expectations. The thick toast is marinated in honey and cut into small pieces before being fried, so the inside is soft and sweet while the outside has a nice crunch. 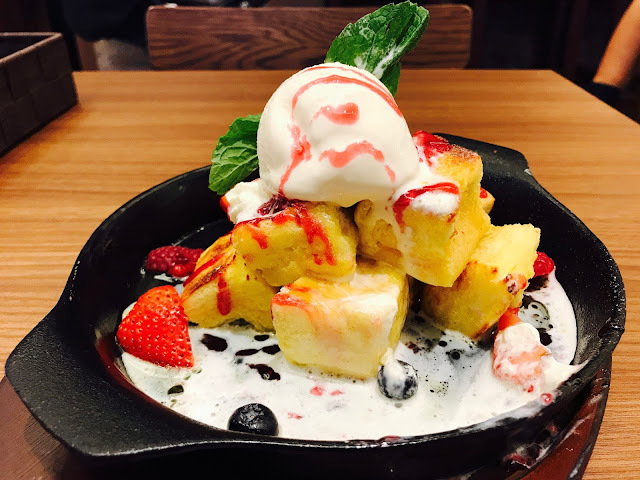 Served with a scoop of premium Haagen Dazs vanilla ice-cream, various fresh berries and drizzled with strawberry syrup, the sweetness of the ice-cream and honey toasts goes well with the tangy berries. This is the perfect dessert. 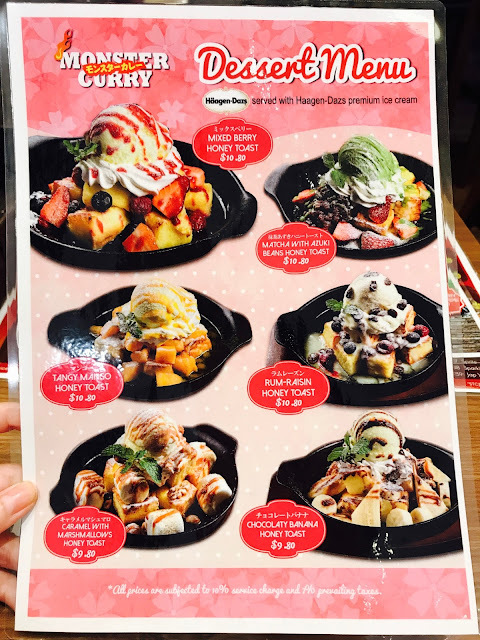 The other options are Matcha with Azuki Beans Honey Toast, Tangy Mango Honey Toast, Rum-Raisin Honey Toast, Caramel with Marshmallows Honey Toast and Coconut Banana Honey Toast. 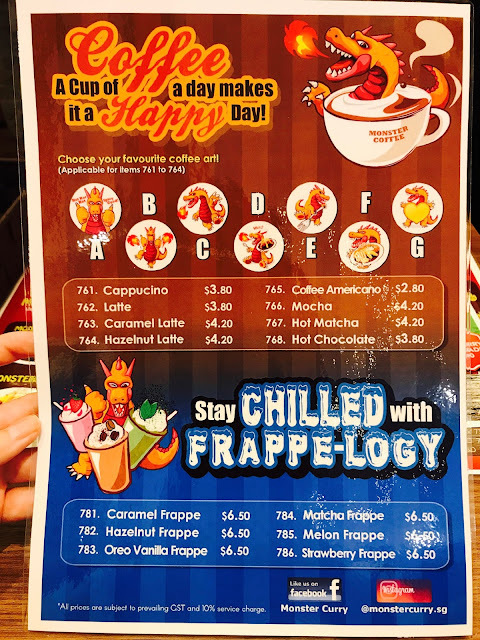 Monster Curry also serves hot and cold coffees with cute dragon-themed coffee art (for Cappuccino, Latte, Caramel Latte and Hazelnut Latte) and mocktails, all of which are only available 2 pm – 6pm. Monster Curry’s signature “demi-glace” curry is the first of its kind in Singapore and it is definitely the first curry I have had so far. It is really quite addictive which probably explains why the restaurant is always packed with people, but the turnover time is pretty fast, so there is no need to worry. 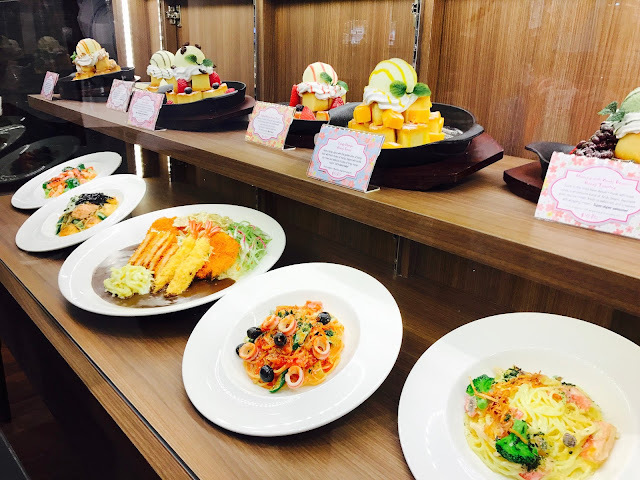 The Suntec City outlet has just started operation for less than a month, many more items such as kinds of pasta and other wonderful dishes will be added to the menu soon. Stay tuned to Monster Curry’s Facebook page and website for the latest happenings. Addresses and telephone numbers of all 7 outlets (the Suntec City outlet is so new that the address is not updated on Monster Curry’s website yet). Monster Curry is available for delivery via FoodPanda.